At Augmentum we emphasize the importance of QA for all our software professionals. We support a dual but equal career ladder for development and QA engineers. QA training is required and an intrinsic part of our staff rotation and career planning. Augmentum offers manual testing services to our customers in the following areas: system/integration/functionality/feature testing; use case/scenario based end-user testing; acceptance testing; sanity testing; validation and verification testing. Our manual testing process is mature and full-featured. Augmentum will create test cases and review existing test cases for retrofit and update, as well as analyze the gap between what is being tested, what has been implemented, and what is required. We manage test cases with a disciplined approach including feature test coverage matrix. During test case execution, we pay attention to the details of bug recording, bug reporting, bug tracking, and bug management. We define, collect, and analyze metrics to understand the effectiveness of our teams’ bug finding and the relevant bug categories. We perform bug lifecycle analysis to highlight reopened bugs, bug age and phase in which bugs were found. Finally, at the end of every QA cycle we perform a postmortem to identify any critical bugs missed during testing or any mislabeled bugs (wrong categorization, severity, priority), and to develop input to our continuous improvement process. Traditional methodologies used in testing software usually face an immovable barrier – time. 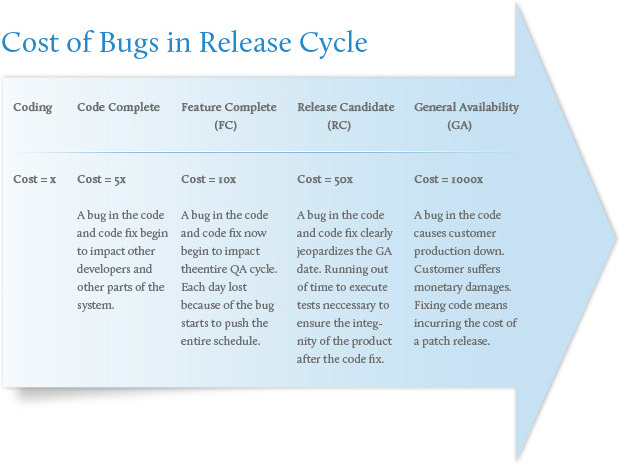 As software approaches the release phase, regression bugs in particular become more difficult to detect before they become showstoppers. For software in the development phase, early detection of bugs is a critical part of building a solid foundation. The problem is compounded in an enterprise software or mobile computing environment. For these teams, releasing products for different locales simultaneously – without compromising on the quality of the products – in an environment where the target hardware platform is changing rapidly or added in response to market demand, and is evolving in different ways, up and down the stack, in different places, increases the demands on test and QA. Augmentum’s Automated Testing practice enables our customers to shift more of their bug discovery and fixing to their early stage of the development cycle, leading to a software release with the lowest total cost for high quality. Augmentum supports many automation tools and environments, ranging from commercially available tools to open source tools to highly customized automation testing frameworks. Please contact us if there are other tools that you would like to investigate. For other customers, Augmentum develops specialized automation testing frameworks based on specific business and technical requirements that are not readily addressed by commercial or open source tools.